A pergola, or an archway typically supporting cross beams and lattice in gardens and lawns, is a growing trend in landscaping design. A pergola, or an archway typically supporting cross beams and lattice in gardens and lawns, is a growing trend in landscaping design. They can support climbing plants, provide shade, and help you to create the perfect outdoor oasis to enjoy with your friends and family. Not only are pergolas on-trend in landscape design, but they also have many benefits. 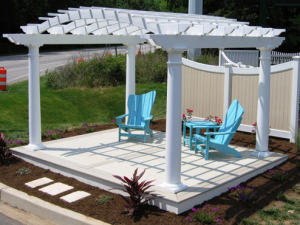 Consider the many reasons to add a pergola to your home landscape this year. The open and airy charm of a pergola can be the perfect way to define space in your garden or yard. The open lattice design of the pergola roof allows you to add structure to your outdoor space without minimizing your space. This will also maximize the amount of light that reaches your garden or patio while helping you to define your outdoor space using flooring and columns. Try adding benches to differentiate your patio from your landscape even more while leaving open space for your enjoyment. Pergolas can also contribute a lot to your garden. By allowing climbing plants to grow up the pillars and across the lattice, you can create an oasis in your backyard. Even consider hanging plants from the crossbeams of your pergola to add even more of a charming garden quality to your patio. One of the greatest qualities of pergolas is how durable and low maintenance they are. If you choose vinyl for your pergola construction material, your pergola will require very little maintenance through the year. It will stand up to warping, splintering, and peeling throughout its lifetime. Because the structure is minimal with a pergola, they provide as much shade as you need based on your specifications, without a full roof that can be subject to warping and other weather-related damage. Finally, pergolas are an affordable way to create your perfect outdoor space and elevate your garden. Pergola construction is simple, especially when you work with a trusted deck and fencing professional. Due to the simplicity of design and minimal need for materials, pergolas are an excellent way to increase your garden’s aesthetic appeal without breaking the bank.